Four players, one a returning champion, compete. In the first round, the three challengers watch a small documentary on one particular subject. This documentary supplies the contestants with all the information necessary to answer a series of questions on that video. Players buzz in for control. 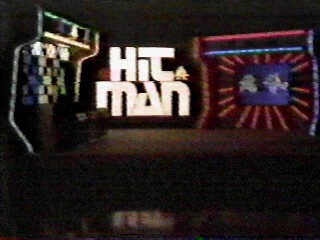 Upon a correct answer, that player's "Hit Man" moves up one step on the ladder behind them. If a player answers incorrectly, s/he is locked out of the next question. The first player to answer 5 questions correctly wins $300 and advances to the second round. The second player to finish wins $200 and also advances. In the second round, the two remaining challengers and champion watch another piece of film about another subject. After the film, each player is allotted a number of Hit Men. The challenger who placed first in the previous round receives 4 Hit Men, the second place finisher gets 3, and the champion receives 7. The host again reads a series of questions based on the material shown in the video. A correct answer elminates an opponent's Hit Man; a wrong answer eliminates one of your own. The champion takes on one challenger at a time; when a challenger loses a Hit Man, the other challenger plays. The champion wins if s/he can eliminate all of the challengers' Hit Men, while a challenger wins if s/he can knock off the last of the champion's Hit Men (even if the other player had done in the first 6). The winner advances to the bonus round. The champion has 60 seconds to answer as many questions as they can about the content of both documentaries that day. The player is presented a board of eight columns; one column has five circles, one column has one, and there are two columns of two, three, and four circles each. After the player turns away from the board and the columns are shuffled, the player picks a column and the host reads questions. Upon a correct answer, one circle in the column is filled with a "Money Man." If an incorrect answer is given or the player passes, that column is negated and the player must choose another one. Filling one column in 60 seconds wins $1000, two columns is worth $2000, and filling three columns wins $10,000. One of the most memorable contestant calls came after the final commercial break of the last show. Rod Roddy said, "If you would like to be a contestant on Hit Man, forget it!" I like to think of this show as one of the most underrated shows that came from the 80's. First off, the format of giving the players the answers and then quizzing them on the material they had seen creates both a playalong facet to the game as well as buzzer battles. The second round packs a lot of excitement as the champion faces the challengers one-on-one. Peter Tomarken does a great job on his first show and I actually kinda liked the whole idea with the cute Hit Men. The only real problem that may have shot this show down: the documentaries consisted only of still photos and dragged on a little bit. Still, it was a great show that I wish would return in some way, shape or form.